In a recent presentation at Linaro Connect, it was revealed that the Linux kernel would be moving to a six-year LTS. 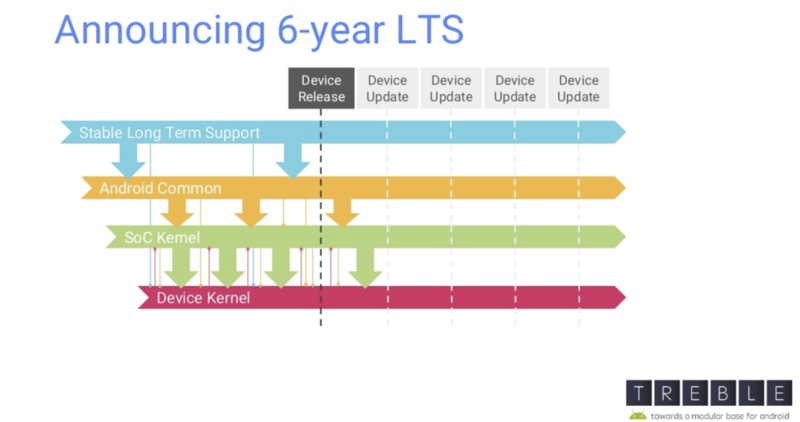 Right now LTS kernels are only supported for two years, which can be a problem when a hardware design pipeline can take more than 12-18 months for a device to make it into a consumer's hands, and that's not even taking into account SoC development. This new change, combined with Google's Project Treble, could further extend device support for Android updates and might spell good news for consumers. All Android devices out there [...] are based of the LTS kernel, the long-term support one. Well the problem with LTS is it's only two years. And so, by the time the first devices on an SoC hit the market you have maybe a year — if you're lucky — of LTS support. And if you're not, it's over. [...] Greg Kroah-Hartman has given me permission to announce this here. He will start, he will extend LTS to six years, starting with kernel 4.4. This is likely to have a big effect on Android because it uses the Linux kernel. Since the Linux kernel tends to see frequent updates these days, most manufacturers prefer to stick with designing things around the two-year LTS Kernels, as they still get back-ported updates and security fixes. In fact, almost all Chromebooks and Android devices live with the kernel version they initially ship with for their entire software support lives. This change to LTS support lengths means that, in the future, your devices might live a bit longer. When a chipset manufacturer like Qualcomm starts designing a SoC (and the software that goes with it), that chipset and its associated software will have a longer 6-year shelf-life. Combined with Project Treble, it means a device could continue to receive updates for much longer. Now it's just a question of whether any hardware companies will care. On the SoC side, Qualcomm has been quick to abandon older hardware in the past. Longer LTS support might encourage them, and everyone in the chain, to extend support. When combined with Project Treble it may not matter if SoC vendors drag their feet, though, so it could just be up to OEMs. Now that there will be six years of support, even a device that languishes in development can hit the market with 4+ years of remaining kernel support. The current SoC king, the Snapdragon 835, is even running V4.4 of the Linux kernel, so we could see most recent flagships affected by this announcement. And with a Googler announcing this change, I hope it's part of a concerted effort on the part of the company to extend software support for its devices. Two years of updates really don't cut it, in my opinion, when competitors like Apple are pushing things so much further.